I have a public confession — I am a Dungeon Mistress, and I love it. I love rolling dice, setting up encounters, watching and listening as players become their characters, laughing and playing with friends. I love Dungeons and Dragons (D&D), the granddaddy of Table Top Role Playing Games. By definition, TTRPGs are games where the players take on the personality of a character, and go out on some sort of adventure, being it fighting an evil entity, solving a grand mystery or something in between. Usually the game involves an element of chance in the form of rolling dice. Role Playing Games are seeing a great resurgence. They have gone from 25 million in sales of books and accessories in 2014 to 45 million in 2016. Today you can watch live play-throughs of D&D and other RPGS 24/7 on YouTube and Twitch. RPGs are making appearances on popular shows such as Stranger Things, Community, and The Big Bang Theory. Gone are the days of the overly dramatic news reports of satanic rituals being played out by teen boys playing Dungeons and Dragons in their basements. No longer entrenched is the trope of unlovable, unemployed, nerdy white guys in their parents’ basement; D&D is in fact for anyone. And as TTRPGs return to the top of popular geek culture, women can be seen front and center. Technology now allows any of us to play with new friends around the world, which makes the game far more accessible and diverse. Women are able to not only watch other women play, they can find like-minded fellow players and enjoy a fun and open playing experience. And this is not just true of D&D; there is a roleplaying game out there for practically every interest and fandom. From The One Ring Middle-Earth Roleplaying Game and Doctor Who Adventures in Time and Space by Cubicle 7 to My Little Pony and Buffy The Vampire Slayer. Love the pooches? Try Pugmire by Onyx Press Publishing. Want something spooky for Halloween? Take Dread out for a spin. And as a woman Trek fan, I’d be remiss if I didn’t point you in the direction of two new RPGs near and dear to those of us wishing to be on the Enterprise. Paizo (the people behind Pathfinder) have just released Starfinder (Think D&D in space!). The one this nerd is most excited to try is the hot-off-the-presses Star Trek Adventures from Modiphius Press. Not so sure about playing? No problem. You can watch along online with a huge growing fandom. Geek and Sundry hosts several RPG shows, Critical Role (live Thursdays, 7pm PDT) easily being the most watched. 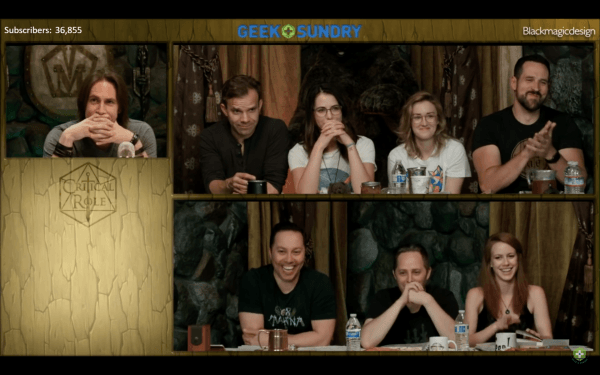 Here, eight popular and highly talented voice actors (including The Blindspot’s Ashley Johnson, Laura Bailey & Marisha Ray) have taken their at-home game and are now playing front of the camera. They have played over 112 “episodes” and have garnered much media attention for helping aid the resurgence of D&D into mainstream culture. Their fans are legion and sell out theatres to watch the actors play live on stage several times a year. With over 430 hours of games available to watch, starting with Critical Role may feel daunting; but I say pick a random episode, give it a good thirty minutes and you will be hooked. 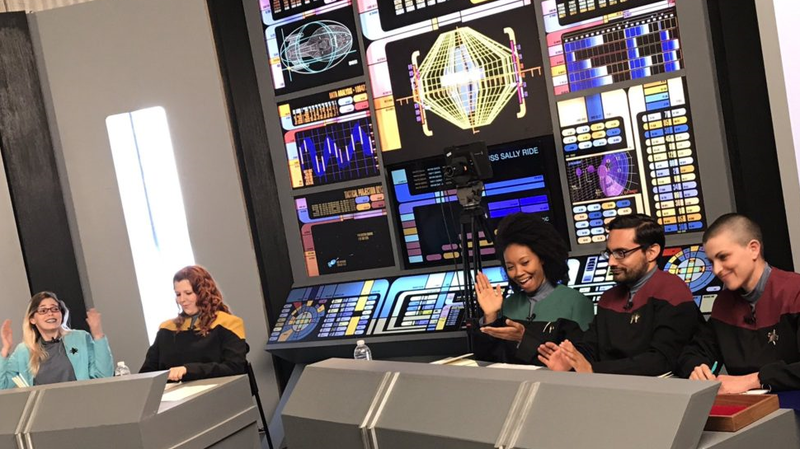 One of Geek and Sundry’s newest shows may be more appealing to you — Shield of Tomorrow. Here, the crew of the USS Sally Ride traverses through Federation and Dominion space, using the new Star Trek Adventures RPG system. The stage is set up like the bridge of a ship, and they wear Starfleet (Voyager era) uniforms. The crew is as diverse as we’d expect on a Federation ship, and you will quickly love them all. This is a great foray into seeing how RPG’s work and enjoying a little extra time amongst Alpha Quadrant friends. Women-led online RPGs to watch include Maze Arcana, an ongoing livestream web series in the D&D world of Eberron (think Fantasy Steampunk), co-created by writer and Dungeon Master Satine Phoenix. They livestream on Sundays 12pm PDT. 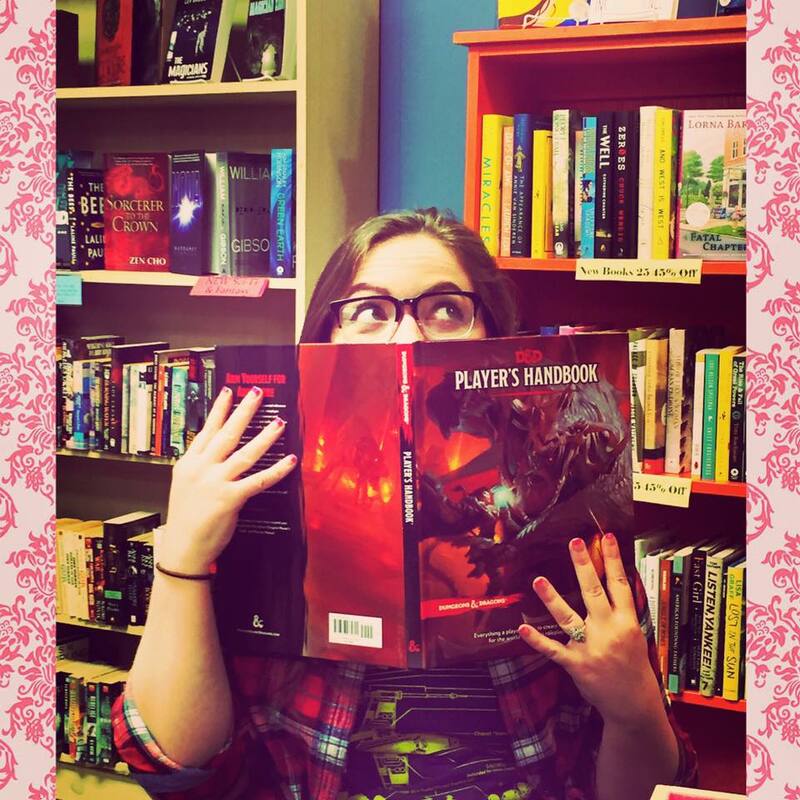 Satine is also the current host of GM Tips on Geek and Sunday, where she and guests impart their RPG knowledge for new and experience players and game masters. 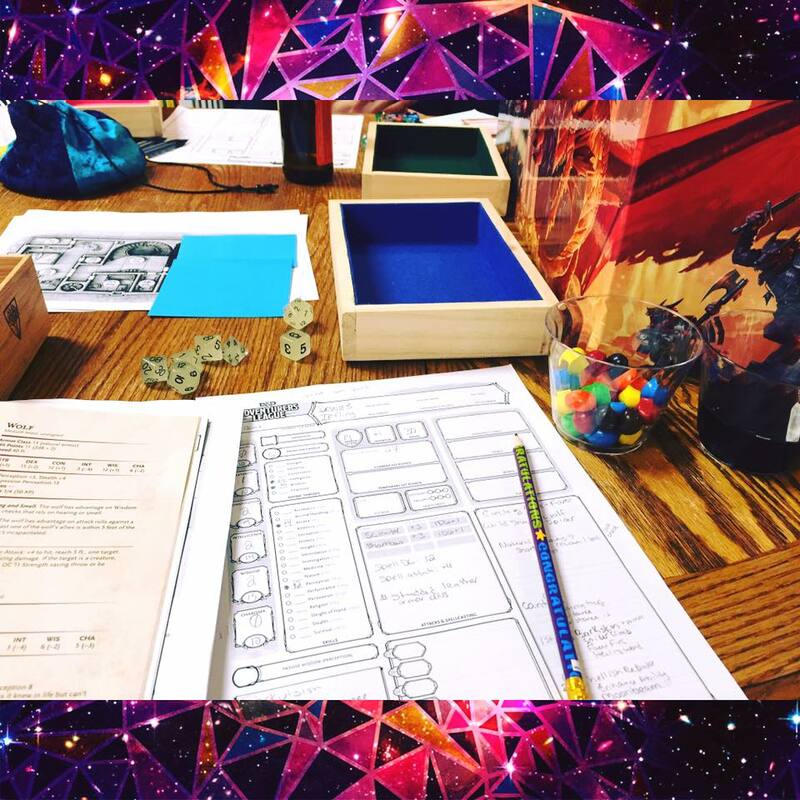 Missclicks is a community of gamers striving to promote inclusivity, where “all genders can participate in geek and gamer culture without fear of prejudice or mistreatment, enjoying acceptance and opportunity.” They host a variety of past RPG shows on their site, as well as live stream new games weeknights. I also recommend two Youtube channels devoted to behind the scenes aspects of playing and running a game. Matt Coville is an author and video game writer, who has a passion for D&D. His weekly web chats delve into character creation, D&D history, and how he runs his own games. WebDM are two experienced players and good friends, who take detailed looks at elements of the game and the rules as written in the core books of D&D. Both will give any player and budding DM a good grip on the game mechanics. And both series make it point to be inclusive of women at the table, making it clear they are just as welcome and capable players as any man rolling dice. Women are playing RPGs, and have been since the day they came on the market some 40 or so years ago. While some still do encounter sexism at the tables, it is becoming the rarity rather than the norm. I suggest heading to your local game shop to see if they have open tables or are helping form groups. Some will even offer women’s-only sessions. Role-playing games are more than just rolling dice, they have been proven therapeutic as you can step into someone else’s skin for a few hours. So, get out there, roll some dice, fight some evildoers, go on adventures, and have fun! 1. The technical, story side, and how roleplaying Star Trek differs (for better or worse) from TV Star Trek. 2. How those differences can make a game more or less inclusive for fans.